My son just came back from the International Scout Jamboree in Japan. I wanted to make a Japanese-ish dish to celebrate his return. I decided to make a chicken dish using soba noodles. 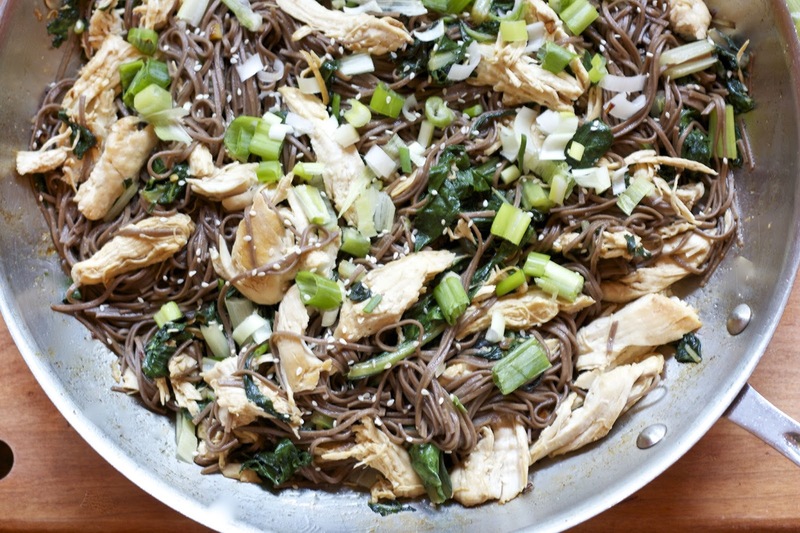 Soba noodles are very common in Japan, but not used often in the US. 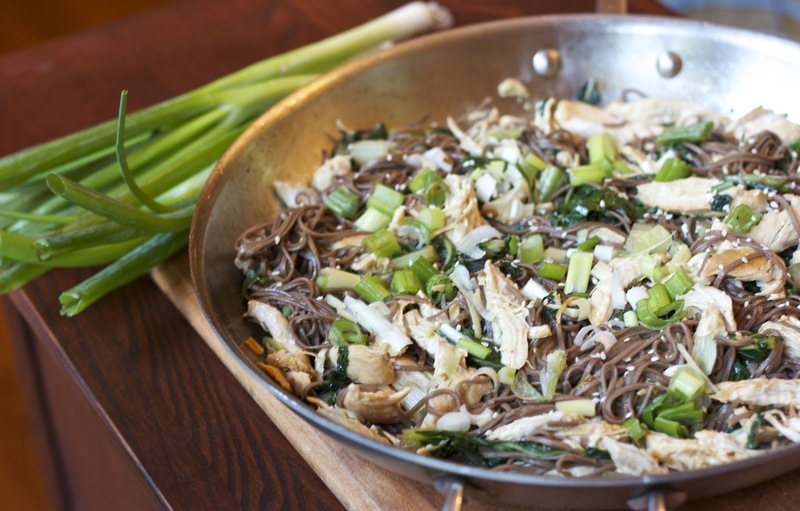 What is great about soba noodles is that they are gluten-free. I have a few friends with celiac's disease, so it's nice to have a few dishes I can make for them that I know are wheat free. Now the strange thing about soba noodles is that they are made from buckwheat flour. Yes, wheat is in the name, but buckwheat is not a type of wheat. Buckwheat is an Asian plant whose seeds are ground into flour. It is very high in dietary fiber and magnesium... plus soba noodles have a great earthy, nutty flavor. I think it's always nice to have a different type of noodle to cook then plain old pasta or egg noodles. Check out this recipe it is super healthy and really tasty! 1) Put a well salted pot of water on to boil for the soba noodles. Cook according to instructions. 2) In a large skillet on medium-high, heat the sesame oil. 4) Add the rice wine vinegar to the pan and scrap the pieces of chicken that stuck with a spatula. Reduce the vinegar a little and pour the scraps and all over the cooling chicken. 5) Add 2 tablespoons of oil to the skillet and sauté the garlic and red pepper flakes for about 1 minute. Do not brown the garlic. Add the greens and ginger and cook until the greens wilt. 6) Shred the chicken and return it to the skillet. Mix. 7) When the noodles are cooked put them into the skillet. Drizzle soy sauce over them and then mix them with the chicken and greens. Garnish with sesame seeds. Serve immediately. It sounds delicious - we always keep a package or two on hand to make noodle bowls or to scramble up with some tofu and spinach or bok choy. Sounds like an amazing experience for your son! My kids love Asian noodles too... you can get really creative with them. Thanks my son had the time of his life. Delicious thanks for sharing with Hearth and soul blog hop, pinning. and tweeting. It's so exciting that your son was able to go to the International Scout Jamboree! What a great experience, Diane! 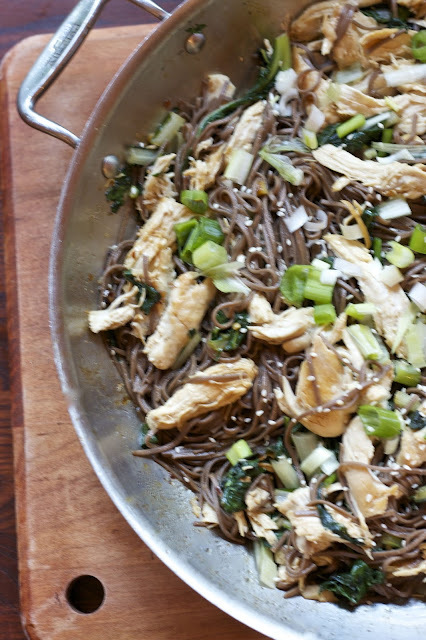 Your Chicken with Greens and Soba noodles looks deliciously wholesome - what lovely comfort food (and a lovely welcome home too!). Thank you, yes it was an experience of a lifetime for my son.